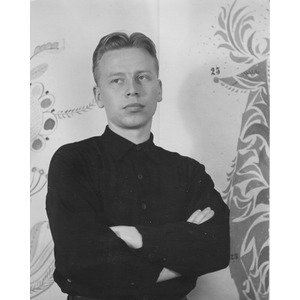 After fighting in the Continuation War in 1944, Martti Mykkänen quit his school in Iisalmi and moved to Helsinki. He got a job at the advertising department at KK Central Society of Cooperatives, while at the same time attending evening classes at Ateneum. In 1948, he was accepted to the Central School of Arts and Crafts and after completing his studies Mykkänen returned to KK Central Society of Cooperatives. He was then given the opportunity to travel to Switzerland as an exchange artist. Switzerland was already famous for its very developed poster art and Mykkänen stayed there for eight months. His time there did not only give him new impressions and inspiration, but he also obtained an insight into different kinds of typeface. One example is the font Helvetica, that quickly after this became popular among Finnish graphic artists. In 1953 Mykkänen was employed by the magazine Uusi Kuvalehti. However he quit after only a year to instead try his luck as a freelance graphic artist. Later in the 1950s, Mykkänen’s posters and book covers began to pay off both in terms of money and fame. He won the first prize in the competition “Best Book Cover of the Year” for the Finnish cover of Leonid Andrejev’s book The Tale of Seven Hanged Men. In the same competition Mykkänen also received no less than five honourable mentions. Roughly estimated Mykkänen has created 450 book covers for almost all the publishing houses in Finland. Martti Mykkänen always strove for perfection when creating his book covers. When taking on a new job Mykkänen was never satisfied with receiving only a summary of the book. No, he wanted to read the whole book so that he could get the right feeling and atmosphere of the story. Poetry books required a second read. When the timetables of the publishing houses were made more stringent in the 1960s, making it difficult to do the job as conscientiously, Martti Mykkänen chose not to design book covers any more. Martti Mykkänen’s work also includes packaging, advertisements and brochures. He also created corporate logos, for example the T-logo for the publishing house Tammi and the three flashes of lightning still used today by Helsinki Energy. He was also the art director for the magazine Look at Finland, published by the Finnish Tourist Board.